MEDFORD/SOMERVILLE, Massachusetts (Oct. 4, 2016) – Nikhil U. Nair, Ph.D., of Tufts University School of Engineering, has been honored with the 2016 National Institutes of Health Director's New Innovator Award for his work on engineering naturally-occurring, safe, gut bacteria to treat inborn errors of metabolism (IEMs), a relatively poorly-studied family of debilitating genetic disorders that affect patients from birth. Part of the NIH Common Fund's High-Risk, High-Reward Research program, the NIH Director's New Innovator Award supports exceptionally creative, early-career investigators who propose innovative, high-impact projects to major challenges in biomedical research. NIH selected Nair for his research on IEMs – disorders such as Phenylketonuria and Maple Syrup Urine Disorder in which the body converts nutrients from food into harmful toxins. If not treated at birth, IEMs can impede intellectual or physical development and may even lead to death. Although each of the 500 or so IEMs are individually considered "orphan diseases" – conditions that affect fewer than 200,000 people nationwide – as a group they affect almost 1 in 1,500 newborns. Because of the rarity of individual IEMs, few researchers explore possible treatments. Currently, the sole treatment option for many patients with IEMs is to eat a severely restricted diet, and even then, it is usually not sufficient to avoid all developmental issues. Nair and members of his synthetic biology laboratory are modifying lactobacillus bacteria that could produce enzymes that intercept and detoxify amino acids before they can be improperly metabolized to harm patients with IEMs. The lactobacilli Nair is using are sold over-the-counter as probiotics and appear naturally in breast milk, so they can be administered as drops or stirred into food ingested by patients as young as newborns. When populated to a healthy density in a patient's intestines, these bacteria have the ability to stimulate the expulsion of toxins, halting their buildup, and allowing patients to eat normally rather than relying on a synthetic diet of mixed amino acids. Nair has also proposed self-regulating control mechanisms to allow the bacteria to manage their own population within the intestines. If there are too many or too few, the patient can eat an ingestible chemical signal that would instruct the bacteria to die off or to multiply. "There are many rare diseases that don't really have any treatment options and don't attract the interest of researchers," says Nair. "But the people suffering from those diseases are just as deserving of our attention. I want my lab to do work that not only has a major scientific impact but also a major societal impact." "Nik's work is another example of the great research being done in engineering for human health," said Jianmin Qu, dean of the School of Engineering. "His unique approach to the study of infant diseases through the modification of gut microbes could have wide-reaching impact on the treatment of metabolic diseases as a whole." Nair has been an assistant professor in the Department of Chemical and Biological Engineering at Tufts since 2013. He received a bachelor's degree in chemical and biomolecular engineering from Cornell University in 2003, and obtained his Ph.D. in chemical and biomolecular engineering from the University of Illinois in 2010 under the guidance of synthetic biologist Huimin Zhao. 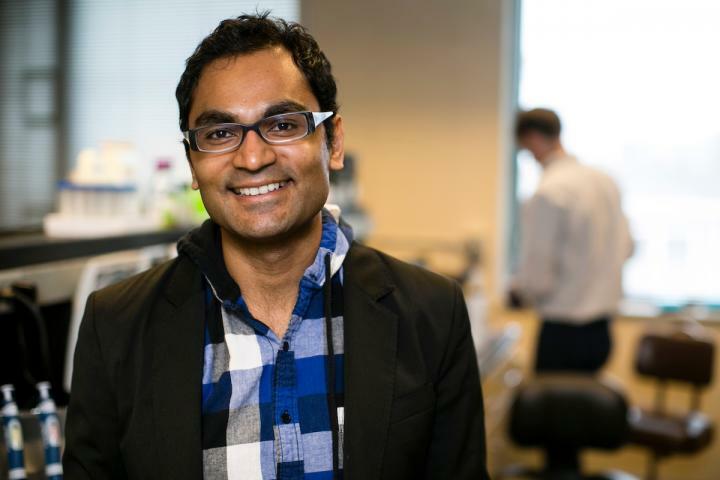 For his post-doctoral training, Nair worked in Ann Hochschild's lab in the Microbiology and Immunobiology Department at Harvard Medical School. The NIH Director's New Innovator Award, established in 2007, supports early career investigators within 10 years of their terminal degree or clinical residency and is part of the NIH Common Fund's High-Risk, High-Reward Research program. The program houses four unique awards supporting exceptionally creative scientists with highly innovative approaches to major challenges in biomedical research at all career stages. Located on Tufts' Medford/Somerville campus, the School of Engineering offers a rigorous engineering education in a unique environment that blends the intellectual and technological resources of a world-class research university with the strengths of a top-ranked liberal arts college. Close partnerships with Tufts' excellent undergraduate, graduate and professional schools, coupled with a long tradition of collaboration, provide a strong platform for interdisciplinary education and scholarship. The School of Engineering's mission is to educate engineers committed to the innovative and ethical application of science and technology in addressing the most pressing societal needs, to develop and nurture twenty-first century leadership qualities in its students, faculty, and alumni, and to create and disseminate transformational new knowledge and technologies that further the well-being and sustainability of society in such cross-cutting areas as human health, environmental sustainability, alternative energy, and the human-technology interface.